Using City Clerk Online, you can fill out applications and submit them online directly to the Office of the City Clerk. Upon filling out and submitting an application, you will receive a Confirmation Number and instructions detailing proper identification, required documents, etc. that you must bring with you (or mail in when permissible) to the Office of the City Clerk to complete your application. Please note that applications submitted online expire after 21 days. 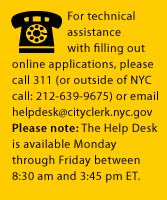 You must complete your application before then either by 1) appearing at the Office of the City Clerk, as required, with proper identification, your payment, and any additional required documentation, or 2) when permissible by mailing your application materials to the Office of the City Clerk as instructed. If you do not complete your application before it expires, you will need to resubmit it. For more information about the services provided by the Office of the City Clerk, visit the Office of the City Clerk Web site. To view Spanish instructions for an application, you may click the “Descargue la guía en español” link located at the top of each page within the application. The Adobe Acrobat Reader is required to download the Spanish instructions. If it is not already installed on your computer, you may download the free reader by clicking “PDF” after the “Descargue la guía en español” link.